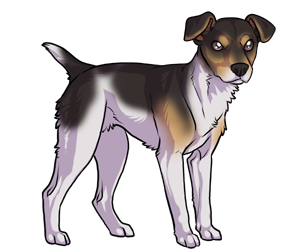 The Rat Terrier is a combination of multiple of terrier breeds including (but not limited to) the Fox Terrier, Old English White Terrier, Manchester Terrier and Bull Terrier. It is an American breed that was created by immigrants during the 19th century. Was the most common farm dog from 1910 through 1930. Used to hunt varmints and for ratting.